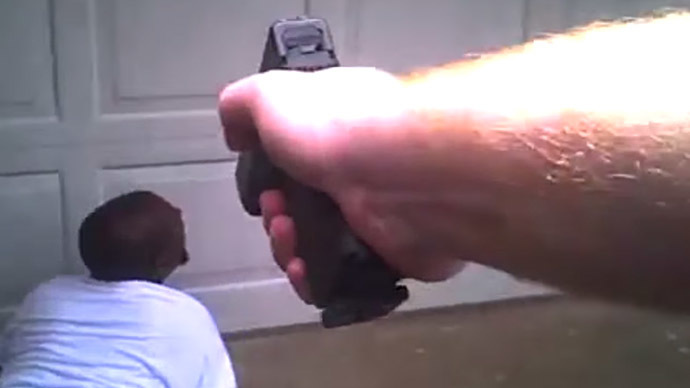 A Dallas County, Texas grand jury declined to indict two officers who shot and killed a mentally ill black man who was holding a screwdriver on his doorstep last June. A federal civil-rights lawsuit is still pending. Officers John Rodgers and Andrew Hutchins answered a call by Shirley Harrison, requesting help with her son, whom she described as “just off the chain” and a “bipolar schizo.” As Jason Harrison, 38, appeared in the doorway behind his mother holding a small screwdriver, the officers opened fire. Harrison was shot six times in the chest, arm and back, dying on the scene. The video of the incident, recorded by the officers’ body cameras, was finally released last month by the Harrison family, which filed a federal civil rights lawsuit in October. The officers are scheduled to be deposed in that case on Friday. “The family is obviously severely disappointed,” the Harrisons’ attorney, Geoff Henley, told the Dallas Morning News after the grand jury declined to indict Rodgers and Hutchins. “But this isn’t going to affect our case. We’ll continue to move forward." Chris Livingston, the attorney representing the two officers, said that watching the video in slow motion shows Jason Harrison moving towards the officers and his arm rotating into a stabbing motion as the first shots are fired. Harrison suffered from schizophrenia and bipolar disorder, and his mother Shirley had called the police on several prior occasions to help her get him to a hospital. He was off his medication that day, but had no history of violence and had not threatened anyone, his brother Sean told reporters last month. It was the first fatal shooting by police captured on body cameras in Dallas.